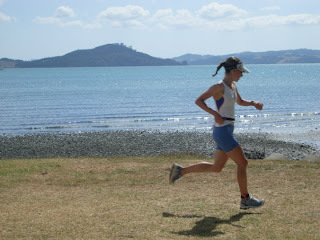 The swim was at Maraetai and was beautiful and flat. Unfortunately the beautifulness was ruined by all the people trying to drown me on the way out to the first buoy. I may not have picked the smartest starting position and got pretty roughed up for the first 400m. After that got into a bit of a rhythm and had some good feet to swim on for most of the way. Got out of the water in around 30mins30 (about 7th woman) so a pretty good swim for me, in fact the first time I have ever swum under 31mins for 2km so maybe all that swimming did pay off. Jumped on my bike and caught a couple of girls in the first couple of kms. Had a couple of guys to ride with for the first 30km but then we got split up going up Snake Hill and then was on my own for the rest of the ride. It was a hard ride!!! Rough roads, little nasty hills and sidewinds. Not much fun really. Was looking forward to Davo catching me (he was in a team and started 30mins after) so I could have someone to talk to for a second but he blew up after 65km and creeped the rest of the way and couldn't catch me. Nutrition isn't overrated apparently. Tried a new Gu flavor on the bike - chocolate-mint and it was sooooooo good, definitely a keeper. That with my Em's CookieBars remembering to eat wasn't a problem. Bike time was around 2hrs51, about 5mins slower than I hoped for and a bit disappointing really. The first half of the run wasn't too bad apart from the nasty headwind on the return leg, but that was about where my fitness ran out. I did the first half in around 47mins and total run time ended up at 1hr40 so positive split by 3mins for the 2nd half, so not the best pacing but could have been worse I guess. I managed to shuffle to the finish my way to the finish, 6mins behind 3rd place. Julia Grant lead off the bike and flew through the run, I thought she was going to lap me but luckily she didn't. And my dear friend The Celiac Kuch and Janine Simpson had great races to come 2nd and 3rd. I somehow ended up with the 2nd fastest run split of the day (behind Julia) so at least know I can run ok on not much training. I only got passed by two people on the run, one being Jared who took the time to slow down and tell me to catch the girl in front of me (like I wasn't trying to!!) and some other guy in a team. Best news of the day was that my leg didn't hurt at all, not even an ache afterwards so that is certainly good news. Good work by Team Bowden who came 2nd in the mens teams and to the Bowden's Boyfriend Daniel who completed his first half Ironman after training through the gnarley UK winter. So a bit of an average race really - good swim, disappointing ride and tough run, more work must be done! !